There a lot of students nowadays taking up Nursing course even those with degrees such as certified doctors and dentists. Medical Technologists have also been shifting to Nursing. The question is why? What are their motives? By guess is that it is most likely because of job availability abroad because nurses have greater demand among medical fields. Yes it’s true, I remember I graduated my Nursing Profession in 1995 with a class of six sections with an average of 35-40 students per section. I thinked 1/3 of us are now working abroad including United States, London, Singapore and in the Middle East. Visit our batch website and you will see how many of us are presently working and living abroad. A paper by Dr. Jaime Galvez-Tan, former Vice-Chancellor for Research of the University of the Philippines-Manila and executive director of the National Institutes of Health-Philippines, entitled “The Brain Drain Phenomenon and Its Implications to Health” revealed that since 1994, more than 100,000 nurses have left the country to work abroad. While the ideal nurse to patient ratio is 1:4, the ratio in government hospitals has increased from 1:50 to 1:100. The Philippines is one of the leading producers and exporters of doctors and nurses. Ironically, many LGUs find it difficult to hire physicians, nurses, and medical technicians. The Philippine General Hospital loses 300 to 500 nurses every year, it was learned. Midwives who are in the front-line in providing health services are also seeking jobs as caregivers in other countries. Tan said in his report that the Philippine Overseas Employment Administration (POEA) has reported that only 84,150 nurses left the country from 1994 to 2004. Other un documented or direct hired to US. From 2000-2004, more than 50,000 have left for at least 32 countries, with the United States, United Kingdom, Saudi Arabia, Ireland, and Singapore as the major countries that received the bulk of nurses. “While the Philippines traditionally produce a surplus of nurses for export since the 1960’s, the large exodus of nurses in the last four years has been unparalleled in nurse migration history,” said Tan. Tan is worried that during the past four years, from 2001-2004, the country trained less than 5,000 nurses a year while 10,000 to 12,000 nurses left the country to work abroad. Number one factor is that ours here are over-worked and under-paid. The international standard for the ideal ratio of nurses to patients in hospitals is 1:4. but in the Philippines the ratio of nurses to patients averages from 1:15 up to 1:25. Even some premier hospitals in the country are suffering from the same situation. In Davao del Sur and in most other hospitals, the ratio would even reach 1:50 up to 1:100. I experienced working in a hospital and got assigned in an Emergency Room alone with only one health aid but I was also handling the male surgical ward of 12-bed capacity. Imagine that. We are bound by this pledge wherever we are. More than the money and whatever things nurses become nurses, nurses like me are commited to care. I wonder why my internet connection has always been failing --- failing me actually. Two days of no connection every week?? Don't I deserve some refund on this intermitent disconnection? And guys they stated in my subscription agreement that I can expect "A 24-HOUR VISIT OF OUR TECHNICAL SUPPORT TEAM." But last week, I was visited only after almost 50 times of follow up (yes I counted). Can I report this to DTI Consumer Complaints Desk? I don’t know really what the problem is: the technical part or the responsiveness of the technical person on their hotline or both. On the technical problem, I learned that the possible problem was on the box, but a line man visited my neighbor using the same Internet provider and he tells me they don’t have problem. One of the technical person who answered my call performed me some configuration which in the long run, enabled me to memorize the same thing they want me to perform. And now here I am again, hardly posting this blog, I just want to apply for my Paypal account and update my EON account. Also to update my website. Maybe I should play again with my son, BUTTTTTTTTTTTTTT he is sleeping. I was writing my blogs on my other blogsite. It’s about Insular life Building in Makati as I was there this morning to pick up my EON Card in Union Bank. There a lot of memories I remember everytime I see that building so I decided to blog about it. I was searching for the picture of the building for my blog and have found pictures of its new image. But I never found the picture of the old building. I regretted to realize that the old building is gone, and even read other blogs that hated the way the new building was improvised. Insular Building in Makati is a historical Landmark, and yet you will not able to recognize it in its new face. I am not against improving or developing such building but I just hope they preserved the looks of the old Insular Life building. Even the Insular life company doesn’t have the memorabilia of the old building. They don’t have pictures of the old building in their website. I hope they will always remember where they came from. Memories from the past made us what we are now in the future. I hope I could get at least one picture of the old historical Insular Life Building in Ayala, Makati. Here's why: 99.99% of all depression information is DEAD WRONG. In fact, most of the 'tips' you've gottenabout depression can actually makeyour depression worse! Some anti-depressants are causing BRAIN damage. The good news is YOU CAN FIX THIS RIGHT NOW! New research suggests that deep brain stimulation can cure depression. It's Friday again. Tomorrow Saturday, is the Biblical Sabbath day. I received an SMS message from Brother Raymond, a newly baptized brother in the Faith, who I find to be a dedicated servant of Almighty Yahweh. Every Friday, I would receive text messages from him (as most brethren do). They contain Biblical texts which are wonderful or inspiring messages. After a full busy week, sometimes messages like these can warm our hearts and can inspire us. Sometimes they make you reflect on your life, and think about the future. Before anything else ---before the money, fame, luxuries ---enough for us to seek His way of doing things first of all. If you are going to ask me what my dream is for my son, my answer would be simple. All I want is to give my son the best education he can ever have. My wife and I are so blessed to be given Kyle David who is so bright and smart. I believe that if we can only afford it, I know he can make it in good schools offering high educational standards. 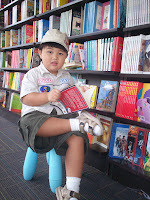 In my heart as well as his mom's heart, our dream is to send our son to an International School. One thing that makes us prefer this school is primarily due to its respect to all cultures and all religions. We would like to bring up Kyle to become respectful and unimposing, and an international school would be the best starting point to experience this kind of environment. However, our financial resources are a barrier to the realization of this dream. His mom and I will still have to strive for it even if we combine our incomes. For now this continues to be our dream. That is, if we rely on ourselves. But we do not rely on ourselves, because we know that it is our Almighty Heavenly Father Yahweh who is our Source of everything. I believe He can make a way for Kyle. I will never stop praying and hoping for guidance that I could enroll my son where Almighty Yahweh wills Kyle will go to school. I didn’t have any formal schooling in computers even in college. Sure, I had my computer subjects for 3 units wayback then, but its all about Dos and the subject gave me the chance to touch a computer for only 3 times. After graduation, my late uncle taught me how use Microsoft word in his office in order for me to prepare my resume and my application letter to my prospective employers. I depended on computer manuals that he provided. It was when I started to work in a Government Health Center that my office mate and best friend Rey introduced me to the world of computers. He used to bring me to computer internet cafes where I’d spend my time just watching him browsing. Then he bought a computer of his own and wanted me to buy also. It all started in a AMD k6-2 400MHZ computer with a 15inc monitor 32 mb ram and CD Rom, with Windows 2000 as OS. Just recenty, I rang up my internet provider as I couldn't log in. I learned it would take two days before it goes back to normal as the company, I realized, had their cyclical maintenance. Two days of server maintenace for me means two days without work. This means two days without income from my online gig. On second thought, maybe things happened for a reason. My newly wed friend Jomarie sent me an email regarding the photos of me and my son Kyle David which he saw posted in my Friendster account. He said I’m a good raiser and it shows on the photos. 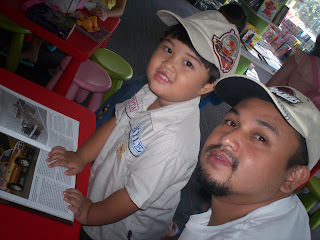 I was touched and realized the reason why I had to rest from my blogging for two days is that so I would be able to spend most of my time with my son. Kit hails from SagayCity Negros Occidental "The Garden City of the North. The beauty of the his surroundings encourages the self -taught photographer to explore nature as his most prominent subject.His equally expressive eyes have always wondered by how waters roar or stay still, how leaves change hues or fall over time, and even how people smile, laugh or cry. He possesses an insatiable desire to capture these remarkable moments and freeze them through his lens---oblivious to the fact that they oftentimes require him to plough through the mud, swim murky waters or climb trees---for his collection of pictures that spell earth's natural character no other rendering can most accurately duplicate. Photography captures him since high school days, but has never been given a chance to have a camera, Kit pursues a great interest in pictures by saving every penny he could from his allowance in order to buy his ever first ever camera, A Canon AE1, Since then, the creative novice went on from black and white developing to learning countless other techniques which he quickly picked up from keen observation, lot of reading, and also with the help of his photographer friends. A registered nurse by profession, his camera has become his constant companion to his various medical missions and travels. The former director of Sagay "sigay" Jaycees Philippines also find himself swithching hats as the organization's official photographer as well, His most fulfilling avocation almost always gravitate to him wherever his noble pursuits would take him---be it the mountain top of Kanla-on City, Steams, seas, rivers, mountains and Islands of Sagay, the forest of Guintobdan, the coldness of Bagiuo,Old houses of Marcos in Ilocus, the mistique of Tinagong Dagay, and his favorite white sands of Boracay. Anyone who takes a glimpse of his signature shots will be nostalgically awed by the quiet charm of rural scenes, traces of which he created perfect harmony of his photographs. Over a year and a Canon EOS 888 camera after, Kit can now click his hand in diverse subjects as well, including people and events, documentary shots and even advertising or promotional materials. Kit is looking forward to turn his hubby into satisfying career in the future. Planning to join national photography competitions,presently submitting contributions for Lakbay TV's Snapshots segment, developing websites and keying in blogs these days too.